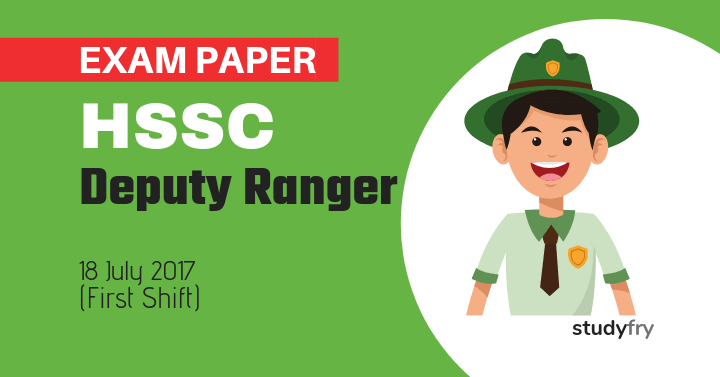 HSSC Deputy Ranger Solved Exam Paper – 2017 (First Shift): HSSC Deputy Ranger at Forest Department, Haryana exam held on 18 July 2017 in three shifts, this is a first shift exam paper. This HSSC Deputy Ranger exam paper available in Hindi language. 6. The sentence given below contains one or more mistakes. Identify the correct sentence. A. Learning French is not easy. B. Learning of the French is not easy. C. French learning is not easy. D. It is not easy learning the French. 7. —– is the synonym of “Contemplate”. 8. The antonym of “Reveal” is _______ . 10. Complete the sentence by choosing the correct form of the verb given in brackets. Tommy ____ (leave) the place only when Rohit came back. 12. 8, 24 और 10 संख्याओं की चौथी समानुपाती संख्यां क्या है? AG : IO :: EK : ? 17. अंक माला को देखिएः 8, 17, 33, 67,______ आगे कौन-सा अंक आना चाहिए?